In this monthly column, project coordinator Megan van der Moezel writes about her experiences in Quito. Livin’ la vida Local: a humorous beginner’s guide to this fascinating country. 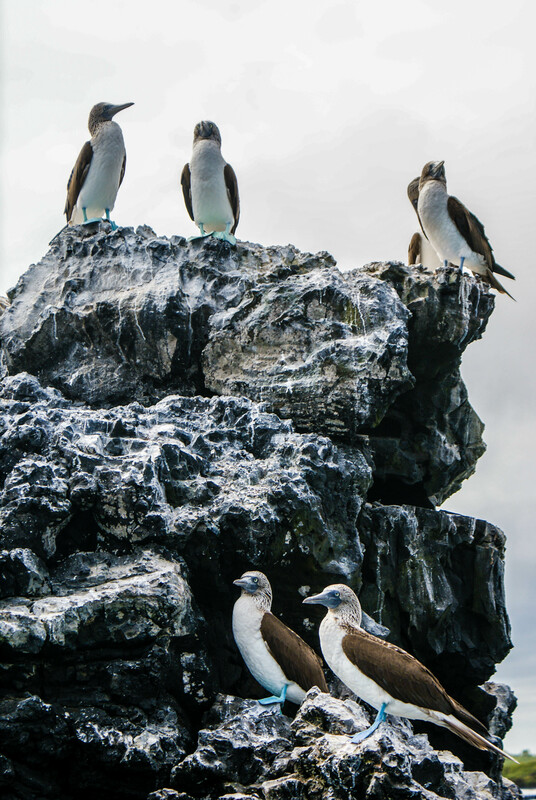 This month a two-part column about Ecuador’s mysterious Galapagos islands. Charles Darwin did it and did it well. Why not try to literally and literary follow in his footsteps? I therefore decided to keep a diary of my Galapagos travels. It was a journey that -like his – took me past amazing animals and impressive landscapes to new conclusions. Because yes, it is possible to visit the Galapagos as a backpacker. And yes, for stronger (and less forgetful) people than me, it can even be done on a budget. It’s the tours, the on-island purchases and the fancy food (sushi! lobster!) that got me in the end. But – speaking of ‘in the end’- it sure was worth it! Quito. Only an idiot would forget essentials such as flipflops, adaptors and chargers when they go to the Galapagos. That idiot, I’m sorry to say, would be me. At least I had plenty of time to spare for some shopping before boarding. Of course, the three shops on Quito airport carry only the most exclusive line of accessories. Not quite prepared to pay $30 for a charger, I opted for a pair of $26 Havaianas only. I’ll just beg, borrow and steal my way around the islands to keep my electrical equipment alive. Baltra. This is by far the nicest airport location I’ve ever seen! Completely surrounded by weird cactus trees and orange sand. Plus the free shuttlebus to the docks had to stop twice for a fat red land iguana crossing the road. Welcome to the Galapagos! Santa Cruz. Arrived in Puerto Ayora just in time to squeeze in a visit to the Charles Darwin Research Station. As if the turtle-shaped passport stamp I collected there wasn’t enough to make my day, I also encountered my spirit animal on the little beach across the road. They look fierce yet seem to do little else then chill in the sun all day. Especially love the WAY they lie. As if they had come falling from the skies and were simply too lazy to get up. Legs stretched to all sides, eyes closed, perfectly immobile until someone accidentally steps on them. 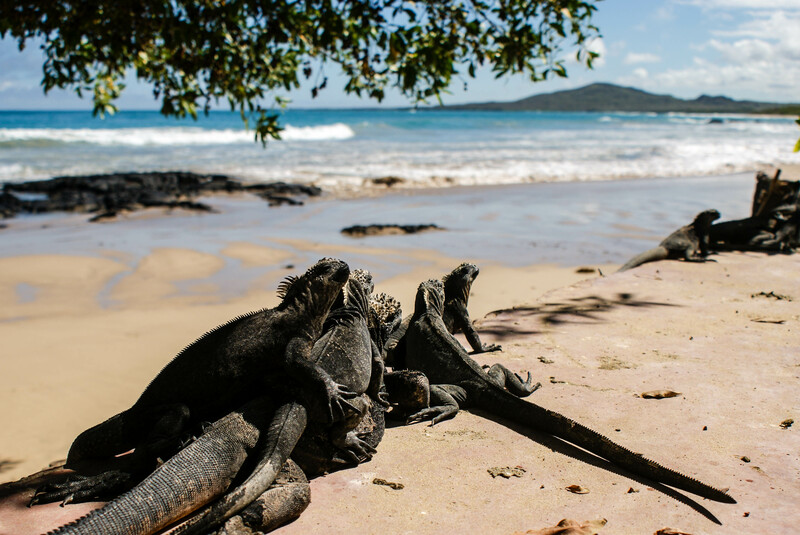 Oh, the life of a marine iguana. I read somewhere that there is great snorkeling in the mangroves one beach over from Tortuga Bay. Imagine my initial disappointment when murky water was all that greeted me on my very first Galapa-snorkel. Then, just as I was following a fish-shaped blotch in the distance, a two-meter-long shark tale suddenly passed right under me. Screamed out loud in unexpected terror. Water came flooding into my mask, which I didn’t waste any time inhaling through my nose. “Accidental drowning by shark-sighting.” That would have been an ironic way to go for someone who’s always dreamed of swimming with sharks. Hammerheads preferably, but this wasn’t the time to be picky. Took revenge on fish-kind that evening by devouring a giant tuna steak on Puerto Ayora’s restaurant-filled malecon. It was right about that time that I cried out in horror for the second time that day., Realized I had forgotten my brand new Havaianas on the beach. Like I said: idiot!. Got myself a last-minute spot on a Las Tintoreras boat tour as soon as I arrived on Isabela. The main events: snorkeling and booby spotting. Blue-footed boobies that is. After a short lancha ride from the bay, we saw a whole bunch of them. Sitting on a rock in the middle of the water. We stared at them, they peered back at us. One by one they started squawking… Felt like I was in a revisioning of Hitchcock’s The Birds. It was awesome! Saw a group of penguins, some sharks (from a safe distance this time), eagle rays and my very first sea turtle too. Great budget alternative to the Tuneles tour! Today I rented a mountain bike to cycle the 5km to the Muro de las Lagrimas. Shrieked with joy when I spotted my first giant tortoise on the way. It came boldly strolling my way in the middle of the road. I sat down next to my bike to give it plenty of room to wobble on by. It didn’t. Planted itself right in front of my mountain bike instead. I contemplated removing the obstacle. But I had mistaken mr. Turtle’s intentions. He suddenly extended his neck to start gnawing on the tire instead. After two failed tries, he thought better of it and began walking away. Then his eyes landed on me, and he paused. My squeals of joy quickly turned to protests. Even though it hadn’t any teeth to speak of, I didn’t really see the upside of letting it have a go at my arm. Neither did he, apparently, because after a lingering stare he turned around and wobbled on towards a more appealing victim. A second tortoise peacefully grazing on the side of the road. Can’t believe the rate at which I get to cross off things from my bucketlist here. Turtle fight? Check! 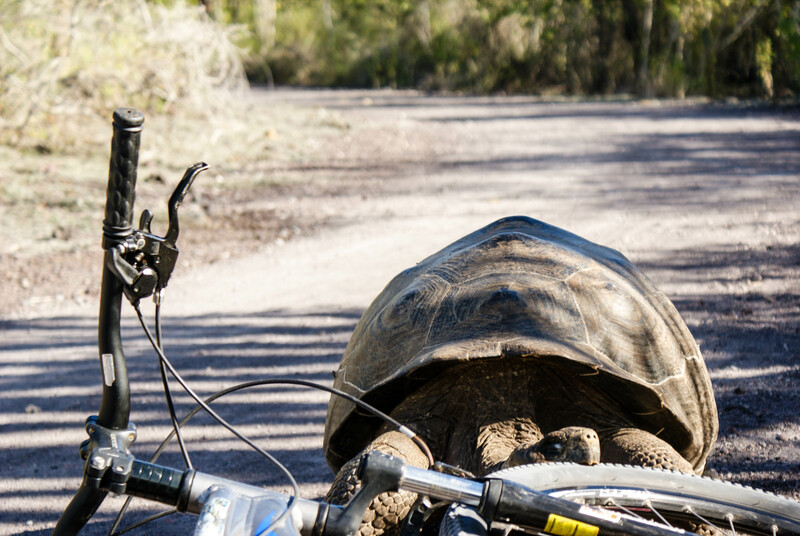 Curious about the rest of Megan’s adventures on the Galapagos Islands? Read about it in Part 2 of her diary.